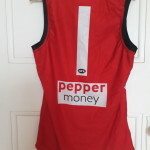 Football Jumpers, Jerseys, Guernseys have had favourite players numbers displayed on them since their inception. 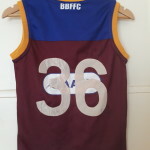 Originally mums, sisters, aunts or whoever could sew, lovingly embellished the afl supporters jumper, with the desired number. It involved cutting out the number from fabric, of one or two numerals, carefully placing them on the vacant back section of the jumper, designed for this purpose, and either hand stitching or machine sewing them on. Fast forward to 2017 and the number on the back of the jumper is now sublimated on, with the official afl logo across the bottom of them. The humble favourite player number has become a slick innovation, and official licensing product of the AFL merchandise team. This entry was posted on Friday, December 8th, 2017 at 9:38 am	and is filed under AFL, Brisbane Lions, favourite players, number, player, popular. You can follow any responses to this entry through the RSS 2.0 feed. Both comments and pings are currently closed.